Apps for conferences are becoming more common. In this blog post, I will be looking at some more generic apps that will cover the categories of social media, notetaking, networking and collaboration. When attending conferences and workshops, there are some amazing apps that can make your life a lot easier when being a participant and even a presenter/speaker. This week I am attending ILT2014 being held at Jupiter Casino and already have joined in the #ILT2014 conversation on Twitter. So hopefully, some of these apps and ‘digital workflow’s will help. Tip: If there is a conference #hashtag organised for a conference, connect with others before the conference begins. It’s a great way to cement friendships online before meeting someone in person offline. If you haven’t discovered Evernote (http://www.evernote.com) then I suggest it is a worthy addition to your conference toolkit. First, set up an account with Evernote and download the different versions i.e. desktop or mobile. Now it’s time to start creating ‘Notebooks’. My recommendation is to set up a notebook with the conference title and then create a new ‘Note’ for each session. Here are my steps below (see image for Step by Step instructions). Step 1: Create a new note – then place the note into your ______Notebook (Don’t just leave it in the generic notebook). Step 2: Add ‘tags’ (just like keywords’ such as ‘training’, and place a _ after the word. i.e. training_ to locate your notes easier. 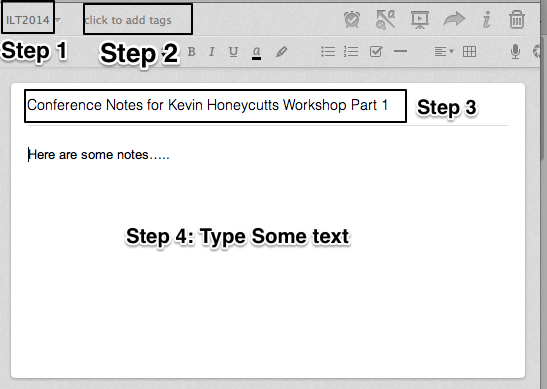 Step 3: Add a title to your Note and then start typing in the blank space below. Tap/Click Done when you are finished. Gail Bennell, a qualified Speech Pathologist from Tasmania shared this blog post on setting up Evernote and IFTTT. Click to read a step by step process how to set this up – a must have for automatically collecting #tweets from your #conference hashtag. My challenge for this upcoming conference is scan individual’s business cards and then hand them back. When you attend lots of networking events, conferences and workshops your business card collection can get slightly out of hand. 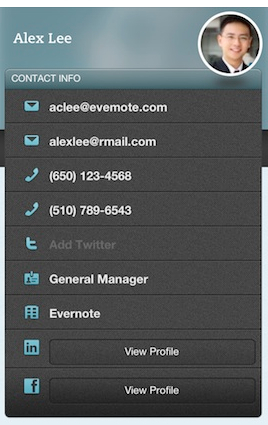 Evernote Hello is perfect for this as it scans the details on your business cards, extracts the details and adds them to your contact list. Meeting details can also be added as well as date/time and location of meeting. 4. Be Paperless with Jot Not Scanner Pro and Cam Scanner! There is nothing worse at conferences than collecting showbags full of flyers, pamphlets and brochures only to throw them out into the recycle bin after you return home. I use ‘JotNot Scanner Pro’ (iOS) or ‘CamScanner (Android) to scan the brochures/articles that I am interested in and then place them into the recycle bin. I also use this same concept to take scans of my handwritten notes since sometimes my mobile devices can run out of steam! It means I am not throwing away notepads at the end of conferences and my notes are filed neatly (I use Evernote’s Document Camera via my iPad). 6. Battery Back up for your mobile devices. Often due to multi-devices at conferences, they can easily run out of battery (tip: always take a battery pack such as a Mophie Powerstation XL Power Pack or the Unu Enerpack Tube Plus – 8000 mAh Power Pack). Both of these devices can charge two devices at once (i.e. iPad and iPhone). I remember in 2010 while attending uLearn in Christchurch, NZ about being fascinated with Google Docs and the power of crowdsourcing information. The process went like this: Someone had created a Google Doc, shared the link via Twitter and others joined in typing up notes (generally on Keynotes). I often look out for these tweets when not able to attend conferences as they are a source of rich knowledge and information. I love Twitter, but the problem is that participants will hear key phrases and this is the only thing that gets shared. Often the best conversations at conferences happen during morning tea, afternoon tea or even the conference dinner. These conversations contain priceless advice and often this is where the best learning has occurred. I use Pinterest now to collect those resources and file them for later reading and exploring. Here is my Pinterest board as an example of some of those resources: http://www.pinterest.com/meganaiemma/. I find the Pinterest app for my iPad the easiest to use for on the go. Here’s to an amazing conference ahead, and remember some of these apps and tips will make for a productive and enjoyable conference. 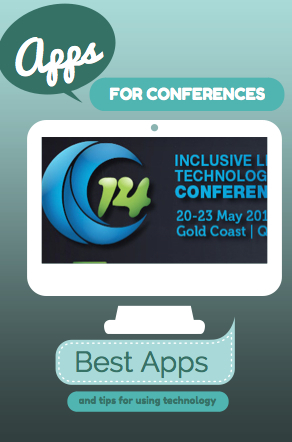 What apps do you like using at conferences? Thanks for sharing these nifty ideas to improve workflow at conferences – I especially like Evernote Hello. I am hoping to get to ILearn this year, as part of the award. Do you have some contacts in Blended Learning that you could recommend? *ULearn – I and U too close on the keyboard!